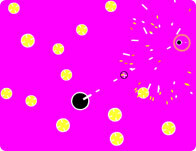 Play the classic version of Snood! Each turn you may launch a randomly selected snood into the play field. Connect 3 or more snoods together to teleport them off the play field. Snoods can be launched directly at a target, or ricocheted off the walls for extra style points! Snoods teleported off the field will also release any other snoods from hanging from them. On later levels, you may encounter sleeping snoods. They must be woken up before they will react to other snoods. Style points are given for more difficult or stylish shots like bouncing snoods off the wall or releasing groups of snoods. The danger meter builds with each snood launched, and recedes when snoods are released. If the danger meter fills, the snoods descend. If they descend past the bottom of the playfield, the game is over. The round is cleared when all snoods are teleported off.